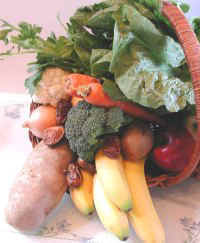 This recipe will make enough to serve 4-6 people as a main dish, or 8-12 people as a side dish. This recipe can be cooked in either a microwave oven on "high" in about 30 minutes, or in a conventional oven at 350 degrees F in about an hour. If you are not using canned beans (2 - 15-oz. cans), we suggest that you cook the beans (1 lb.) the day before, and store them in the refrigerator, in a crock pot over night, or in a pot on the stove top early in the morning. 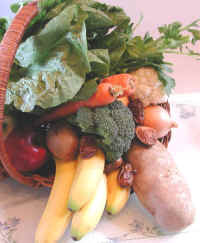 Begin by washing and cleaning the cabbage, and washing and peeling the potatoes, carrots, and onions. Slice them all into bite-sized pieces, place them into a large baking dish mounding the veggies up above the rim of the baking dish (adjust the quantities to fill the baking dish), and cook covered until the veggies are tender. To ensure uniform cooking, mix every 5 minutes when cooking in a microwave oven, or every 10 minutes when cooking in a conventional oven. 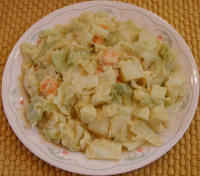 While the potatoes, cabbage, carrots, and onions are cooking, prepare the un-cheese sauce by placing the drained white beans in the container of a high speed blender. Add the lemon juice, nutritional yeast, cayenne pepper or hot sauce (if desired), and smoke flavor (if desired), cover the container, and run the blender at high speed until the ingredients are creamy smooth (use the tamper as necessary). 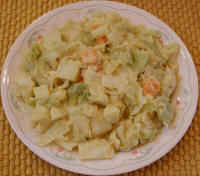 When the potatoes, cabbage, carrots and onions are cooked, add the un-cheese sauce, mix well, and cook for another 5 minutes uncovered in the microwave oven, or 10 minutes in a conventional oven. As a main meal, serve and enjoy with a large tossed salad, or serve as a side dish. Leftovers can be stored in covered baking dish, or in another covered container in the refrigerator for a few days.